A visionary BHAG as a 10-25 year compelling goal that stretches your company to achieve greatness. 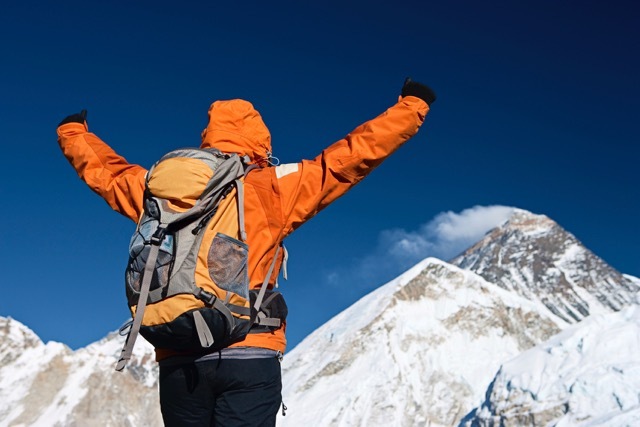 It should be a huge, daunting task, like climbing Mount Everest, which at first glance, no one in the company knows how on earth you will achieve. Jim Collins and Jerry Porras first coined the term BHAG (Big Hairy Audacious Goal, pronounced BEE-hag) in their 1994 book entitled Built to Last: Successful Habits of Visionary Companies and it has inspired thousands of companies since then. It should have what we call a “gulp factor”... meaning that when people hear it for the first time, they must swallow hard to take it all in. But there is magic in the gulp factor, magic in the unknown. A great BHAG will cause your team to stretch beyond the obvious and beyond the status quo. Just like stretching a rubber band creates energy, stretching your team also creates energy. And committing to a goal that you don’t know how you will achieve creates an environment of innovation. Necessity, after all, is the mother of invention. In addition to energy and innovation, a great BHAG will also provide inspiration. It gives people a vision of what the future might look like if everyone pulls together and gives their individual best to the collective effort. Combine your BHAG with a noble Core Purpose, and your people will embark on a crusade to achieve greatness. There are 3 parts to provide you with insight as you set out to create, revise or launch your BHAG. If you're looking for inspiration you can see our blog post that outlines several classic BHAG examples that you can help use as your own personal BHAG template. Inspire your company to achieve greatness. Learn the three key steps to establish, revise or launch your BHAG - Big Hairy Audacious Goal. Know Thyself: Discover The Hedgehog That Drives Your BHAG. Your BHAG will serve as a guide for your organization as you move into the future. Therefore, it is important that it be grounded in and reinforce the fundamentals of your business. That means, you must understand your Hedgehog Concept. The term Hedgehog comes from the famous essay by Isaiah Berlin titled “The Hedgehog and the Fox.” The story contrasts the fox as a cunning animal who knows many things, always seeing the world in all of its complexity, with the hedgehog who knows one big thing really well and simplifies a complex world through a single organizing idea. As it relates to business, fox companies recognize and pursue every opportunity, seeing the world in all its complexity. They work to be good at many different things so they can take advantage of opportunities as they are presented. They become scattered and diffused, never really becoming great at any one thing. Hedgehog companies, on the other hand, are laser-focused, understanding and concentrating on what they are best at. They are able to simplify a complex world into a single organizing idea, always considering first whether or not an opportunity fits into their pattern of success. In order to understand your company’s Hedgehog Concept, you must first answer three fundamental questions. What can you be the best in the world at? The question is not “What are you best at?”; it is what can you be best at. Consider what would happen if you were to focus your energy and effort on one main thing. What could you become best in the world at? It’s important that you be honest as you answer this question. It is not that you are setting a goal to become best at something, it is that you understand with certainty what you have the ability to become best at. And it is equally important that you understand what you can NOT become best at. What are you deeply passionate about? In order for a company to be great, the people in the organization must be fully committed and engaged in their work. This requires engaging their hearts along with their heads. Understanding the purpose of your work and the passion of your people and being intentional about pursuing opportunities that align with that purpose and passion is an important piece of understanding your Hedgehog Concept. The idea is not to work to get people passionate about what they are doing, it is to make a strategic decision to do the work that naturally inspires passion in your people. It is the intersection of the answers to these three questions that develops your BHAG Hedgehog Concept. It is the work that inspires your team, that you have the potential to do better than anyone else, and that you can make money doing. Understanding what that looks like, and boiling it down to a single organizing idea that you can use as a filter for simplifying a complex world, this is your company’s Hedgehog Concept. We also have a handy blog article about how to have the right discussions to get to your BHAG. Now that you have a clear and intentional understanding of the fundamentals of your business, your Hedgehog Concept, you are ready to begin working on your BHAG. A great BHAG will be easy to understand, will serve as a focal point for unifying team effort and should guide decisions on a daily basis. With this in mind, you certainly want to set a goal that is aligned with your company’s “Passion,” “Best At” and “Profit per X.” Your BHAG should be clear, compelling, engaging, inspiring and measurable. Remember that the purpose of setting this visionary BHAG is to paint a picture of what a successful future could look like, so your BHAG must also be descriptive. Start by first talking about the vision for the company. In your wildest dreams, what would you like to accomplish? What is the ultimate picture of success? Now describe what the company will look like when it is operating at a level that achieves that success. What is the benefit for your customers, your employees, your shareholders? Paint the mental picture for yourself and your team. Once you are all aligned around the vision, you can start discussing and brainstorming your visionary BHAG. What is one clear, compelling and measurable goal that will be reached when the vision becomes a reality? Make a list of potential ideas. You may even be able to combine a few ideas into one measure of success. Which of these ideas seem to convey the feeling and spirit of the vision? Narrow your list down to two or three potential BHAGs. It is important at this point to stop and make sure that all of the potential BHAGs remaining on your list are aligned... that they are painting a picture of the same future. This is a simple test to ensure that first and foremost, the executive team shares the same vision. It may still take more time and effort to agree on how best to state it or measure it, but alignment at this stage is very important. Once you have this alignment and have narrowed your BHAG ideas down to just a few, you can test those ideas against the following questions with our BHAG template. Do you find this BHAG exciting? Is the BHAG clear, compelling, and easy to grasp? Does this BHAG somehow connect to the core purpose? Will this BHAG be exciting to a broad base of people in the organization, not just those with executive responsibility? It is undeniably a Big Hairy Audacious Goal, not a verbose, hard to understand, convoluted, impossible to remember mission or vision "Statement"? In other words, does it pass the "Mount Everest Standard"? Do you believe the organization has less than 100% chance of achieving the BHAG (50% to 70% chance is ideal) yet at the same time believe the organization can achieve the BHAG if fully committed? Will achieving the BHAG require a quantum step in the capabilities and characteristics of the organization? In 25 years, would you be able to tell if you have achieved the BHAG? Remember, it's a process not an event. The best BHAGs are usually the result of an iterative process. Establish a THINK Rhythm to work on your Hedgehog Concept and your BHAG. Grow With Purpose: Put Your BHAG To Work. Your BHAG must be more than a poster on the wall. It should be a rally cry! Everyone in the company should know what it is and understand exactly how their day jobs contribute to one day achieving this goal. It is through this understanding that people in the company are able to connect everyday execution to long-term strategy. Do we even care about this opportunity? Is it aligned with our Passion? Are we any good at it? Is it aligned with our Best At? Can we make money doing it? Is it aligned with our Profit/X? Does it move us closer to achieving our BHAG? Using these four questions to evaluate opportunities will you to say "Yes" to the right decisions and "No" to the rest. Allow your BHAG to be a driving influence in setting your 3-5 year plans and Annual plans. Every year, every milestone and every key initiative should have a direct correlation to your BHAG to ensure that you can reach your goal and keep your team aligned around its long term strategic vision. When creating your execution ready quarterly plan for your 13-week race, you need to make sure that you devote enough energy to keep progressing towards your goal. Once you have done the hard work to determine the right BHAG for your company over the next 10-25 years, now you get to reap the benefits of having your strategic direction set. In order to use your BHAG to grow with purpose, you need to bring it to life in your organization and start your Path of Progress™ to Breakthrough Execution. Put it at the top of your next weekly staff meeting agenda for a team review of your BHAG and what you are doing to get there. If you can't clearly define it, set aside some time to discuss using our free BHAG guide.